What is it about energy bites—also known as energy balls or protein balls—that we can’t seem to get enough of? Is it that they’re so easy to make with no preheated oven required? Is it that they’re the ideal mix of sweet and salty flavors rolled together to perfection? Or is it their bite-sized quality, making them the ideal afternoon snack or pre-workout fuel? No matter the reason why you love energy bites, this healthy food staple is here to stay, and lucky for us bite lovers, there are plenty of iterations to keep your taste buds guessing. You might think cinnamon buns can’t fit into your healthy eating plan, but think again. This recipe proves otherwise, including all the right ingredients to give you that warm, cinnamon-filled taste without the sugar-laden calorie count. 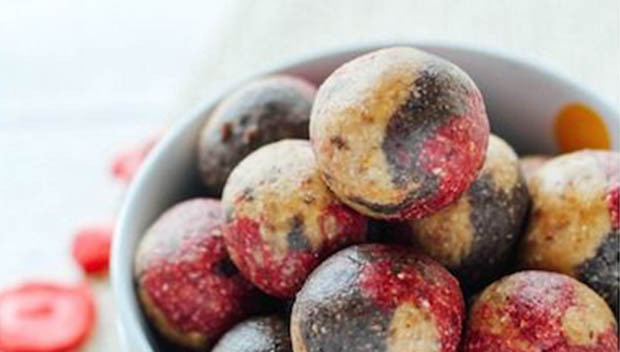 You only need a handful of all-natural ingredients to create these eye-pleasing energy balls. The swirl is in thanks to strawberry, banana and chocolate that combine for a visually striking effect. Want a shot of caffeine added to your next snack? Try these oh-so-green energy bites that call for a tablespoon of powdered matcha. These bites are also refined-sugar-free, dairy-free, gluten-free and Paleo-friendly. With only seven ingredients, these bites come together in just 15 minutes and will remind you of schooldays past when all you needed was a PB&J sandwich to turn your day around. Is Almond Joy one of your favorite candy bars? Get your fix without all the processed ingredients thanks to these bites. With ingredients like oatmeal, dates, almonds and coconut, this is a completely plant-based snack. Next time you start to feel drowsy, pop one of these into your mouth for a zesty and tangy wakeup call. With only four ingredients, you’ll be hard pressed to find an energy bite recipe this simple. These bites are also vegan, gluten-free and contain only whole foods. Freeze-dried blueberries provide the cool, crisp taste central to these satisfying bites, while dates and cashews combine for a creaminess that skips the use of heavy dairy products. These delicious energy balls taste just like scoops of cookie dough but with a unique ingredient twist: the use of protein-packed chickpeas. They are also free from refined sugar and come together in 10 minutes flat! Who doesn’t love the taste of gingerbread on a cold, blustery day? Instead of reaching for the cookie jar, try these healthy bites instead. All work is done in a blender with this one—just add the ingredients, blend and roll the mixture into balls. These bites have a perfectly balanced flavor profile—thanks to savory peanut butter, salty cashews and sweet honey—and will satisfy all your snacking needs, no matter your cravings that day. This recipe packs not one, not two, but three types of fruit in a very small package. With cranberries, dates and strawberries spiced to perfection then rolled together with cashews and walnuts, you’ll be hard-pressed to find an energy bite quite like this. These bites are nut-free, low in sugar and pack in the produce, with dates, carrots, ginger and coconut all listed in this recipe. And best yet? They taste just like a slice of carrot cake but without all the sugar.